It was a dull day today. Sun has not peeked through the clouds for the last couple of days. The weather has changed drastically. I had never seen rain and Thunder storms in January...and it is not expected especially after one week of harsh cold. On my drive back home, I saw a herd of deer grazing in someone's front yard and they seemed least bothered by the passing by vehicles. These sights sometimes put you in deep thoughts. 'Well they have to find their own food even if it snows or rains, so nature had made them tough enough to get adapted to this weather. On the other hand, we humans complain for everything that is granted for us. Look at them, they seemed to be enjoying the feast with their family in harmony even in the cold'. My thought process was perturbed by the question "What are we having for dinner?" by my little one who was anxiously waiting to get home after his extended day care after school. Oh yeah, I have to think about dinner too. I told him 'let me see what we have at home'. Any version of pasta is welcomed by my kids. It is an easy dinner fix for me. 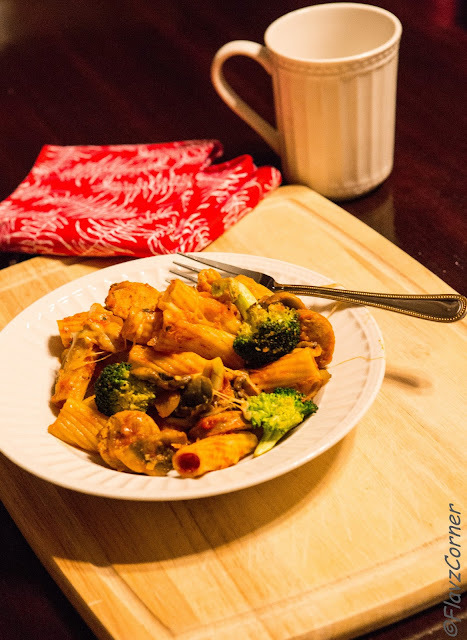 After the whole day of school and extended day, my little kindergartner gets exhausted and goes to sleep early, so I rely on pasta dishes for quick dinner. 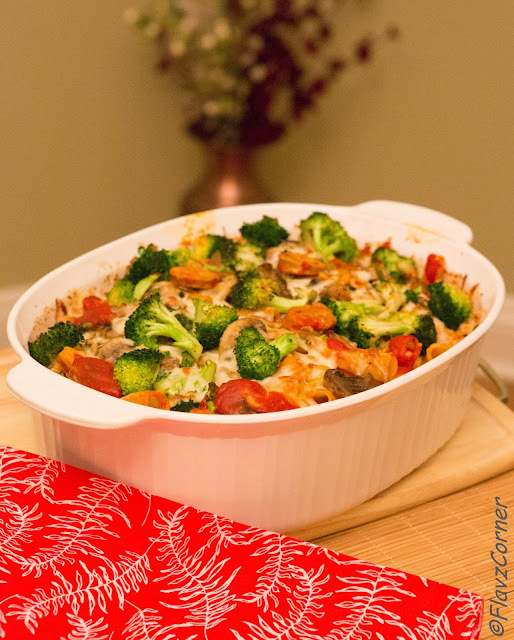 Here is the recipe for the baked pasta with chicken sausage that I made for dinner. Cook pasta according to the package direction and reserve 1/4 cup of pasta water. Cook the sausage according to the package direction. Since this is already cooked sausage, you can just pan fry it for couple minutes and keep it aside. In a non-stick pan cook the chopped garlic in olive oil till golden brown. Add sliced Onions and wait till it caramelizes by increasing the heat and saute for 3-4 minutes. Add mushroom followed by broccoli and sausage and cook for 5 minutes. Add salt and pepper to taste. Remove one cup of vegetable mix from the pan and keep it aside. Add 1/4 cup pasta water, tomato sauce, wine and basil to the left over vegetable mix in the pan and bring to boil. Turn off the stove and pour the sauce mix over the cooked pasta. Add 1/2 cup of parmesan and 1/2 cup of mozzarella cheese to the pasta and mix well. Take a bakeware and drizzle some olive oil at the bottom of the baking dish and transfer all the pasta-vegetable-sausage mix to it. Spread 1 cup of the reserved roasted vegetables over the pasta and sprinkle the rest of (1 cup ) mozzarella cheese on top of it. Cover with an aluminum foil and bake for 20 minutes. Remove the foil and broil it for 5 minutes till the cheese starts to get a golden brown color. Serve them while they are hot. Use any tubular pasta like Penne, Ziti etc. Substitute the vegetables with veggies of your choice. There are different flavors of Al Fresco Chicken sausages available; feel free to use the one you prefer. Pasta bakes are good only when they are piping hot, so serve immediately once taken from oven. You can make the pasta, vegetable and sauce mix ahead and keep it refrigerated. Don't mix the sauce with pasta till ready to bake. Mix the pasta and sauce and layer the cheese just before baking. They are easy to make and tastes wonderful!!! 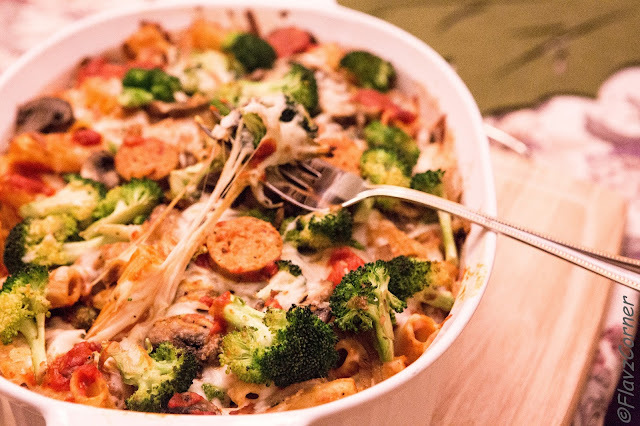 I love baked pasta and this Baked Rigatoni with Roasted Pepper and Asiago Chicken Sausage of yours looks so amazing and delish, Shibi! Sorry, I can't believe I have't joined your site yet. I am your latest follower! Abby from Manila Spoon - Do join me at Manila Spoon (FB page) during Fridays for our global food friday. You may just have the right recipe to share with us. Thanks!